The paper deals with the study of phase transformation temperatures of Fe (Fe–C–O) based metallic alloys. Six model alloys with graded carbon and oxygen content were used for experimental investigation. Low-temperature region (<1000 °C) was the investigated area. Phase transformation temperatures were obtained using Differential thermal analysis and Setaram Setsys 18TM laboratory system. Controlled heating was conducted at the rates of 2, 4, 7, 10, 15, 20 °C min−1. Region of eutectoid transformation (Feα(C) + Fe3C → Feγ(C)), alpha–gamma (Feα(C) → Feγ(C)) and transformation Feα(O) + Fe0.92O → Feγ(O) + Fe0.92O was studied. New original data (phase transformation temperatures) were obtained in this study. 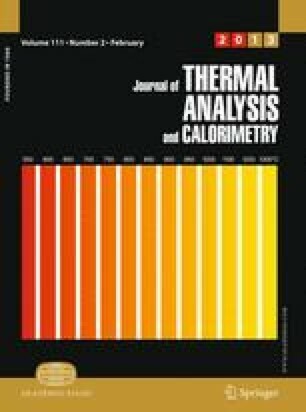 The relationship between shift of phase transformation temperatures and chemical composition (mainly carbon and oxygen content) is investigated in this paper. To achieve good approximation to the equilibrium conditions, the extrapolation of the obtained phase transformation temperatures to the zero heating rate was performed. The influence of experimental conditions (heating rate) on temperatures of phase transformations was studied as well. Comparison of the obtained experimental data with the data presented in the accessible literature and IDS calculations (Solidification Analysis Package) was carried out. It follows from literature search that there is a lack of thermo-physical and thermo-dynamical data on Fe–C–O system. The study was carried out in the scope of the projects of the Czech Science Foundation (107/11/1566 and 106/08/0606) and the project No. CZ.1.05/2.1.00/01.0040 “Regional Materials Science and Technology Centre” within the frame of the operation programme ‘Research and Development for Innovations’ financed by the Structural Funds and from the state budget of the Czech Republic and of the student’s project entitled ‘Selected studies of heterogeneous systems’ (SP2011/17), and it was financed from the specific research resources of the Faculty of Metallurgy and Materials Engineering, VSB-Technical University of Ostrava, Czech Republic.